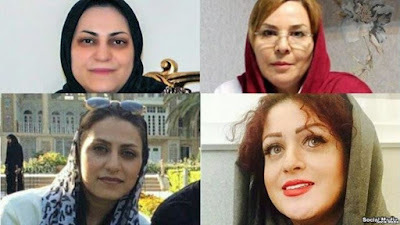 INU - An Iranian court has sentenced four women of the country’s Gonadabi Dervish minority to five years in prison for participating in an anti-government protest that turned violent in Tehran, according to New York-based Center for Human Rights in Iran (CHRI). The women are identified as Nazila Nouri, Avisha Jalaleddin, and sisters Shima Entesari and Sima Entesari. Shima Entesari’s husband, Mahyar Shalchi, said that a revolutionary court in Tehran sentenced them on charge of "conspiracy against national security" on Tuesday. Majzooban Noor, a news outlet that covers the human rights situation of the Gonadabi Dervish community in Iran, confirmed the sentences on its social media channels. Shalchi, was quoted as saying that the women called the lengthy prison terms “unfair”, and hoped to rescind them in an appeals court. However, it is unclear how such appeals might be made, and no word on the sentences is found in Iranian state media. Eleven Dervish women were detained by Iranian authorities during anti-government protests in Tehran on February 19th and 20th. When the protests escalated into clashes with police, five security personnel were killed and authorities arrested some 300 people. Five more women await sentencing. The Dervish women were demonstrating for the release of members of their community who had previously been arrested, and the removal of security checkpoints around the house of their 90-year-old leader, Noor Ali Tabandeh. Sedigheh Khalili, the mother of Sepideh Moradi, one of the detained Dervish women currently awaiting sentencing, accused Iranian security agents of severely beating her daughter and the other jailed women at Qarchak prison on Tehran's southern outskirts. In a phone interview last week, Khalili said she learned of the alleged beatings from security guards who spoke to her when she visited the prison that day. She also said she was refused permission to see her daughter. Iran executed Mohammad Salas last month. Salas was a Dervish man charged with driving the bus that killed three of the Iranian security personnel during the protests. He confessed to the killings in a trial that ended in March, but rights activists claim he was tortured into making his confession. Dervishes are also known as Sufis, and are viewed as heretics by Iran's Shiite Islamist rulers. They have a history of harassment by Iranian authorities.